You are unable to play HTML5 videos in Internet Explorer 11, the HTML5 player displays a black screen only. A post on the MSDN Blog states: In order to play HTML5 videos in the Internet Zone, you need to use the default settings or make sure the following registry key value 2701 under HKCU\Software\Microsoft\Windows\CurrentVersion\Internet Settings\Zones\3 is set to 0. However, when setting the value of 2701 to 0 in this location the value does not stick and reverts back to 3. Process Monitor showed that Group Policy was setting the value to 0, and then back to 3. Despite putting this policy last, and trying various other tactics I was unable to change this behaviour. 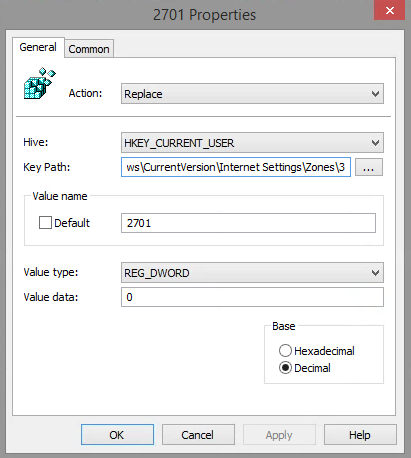 To apply this setting, you can also use the following key location: HKCU\Software\Policies\Microsoft\Windows\CurrentVersion\Internet Settings\Zones\3. When set here, the value of 2701 will not revert back to 3 (disabled), and HTML5 video playback will be enabled. You can set this via GPP as below. We recently covered preparing Active Directory and deploying the LAPS CSE/Client to the machines you wish to manage in part 1 of deploying Microsoft LAPS. Part 2 covers “Turning on” LAPS via Group Policy, the LAPS process and how it works once deployed. On your LAPS management machine, head to C:\Windows\PolicyDefinitions, there you will find AdmPwd.admx and AdmPwd.adml (under en-US). Copy these files into your Group Policy Central Store, if you do not have a Central Store (and do not which to create one) you can launch Group Policy Management Console directly from your management machine, or copy the ADMX/ADML to a Domain Controller where you will be editing the policy. This is where you’ll choose your password policy. The default is complex passwords, 14 chars and a password age of 30 days (machines will automatically change their password when this is met). A lot of organisations will use the same local administrator password across all machines, which is a bad idea for a number of reasons. At a basic level, if this password is learnt, it allows anyone to install software as an administrator – at a higher level it facilitates things such as pass the hash, mimikatz and general reconnaissance against your machines (usually with the goal of elevating to Domain Admin). If you currently deploy your Local Administrator Account via Group Policy Preferences, this makes things even easier for an attacker to obtain the shared local administrator password. The CPASSWORD value is easily searchable against SYSVOL and Microsoft provide the 32-byte AES key which can be used to decrypt the CPASSWORD. Alan has a great post here why you should stop using Group Policy Preferences for deploying Local Administrators. This post will cover steps 1, 2 and 3. First off, we’re going to install the management portion of LAPS. Download LAPS here and next, next through the installation. On the custom setting page choose all of the management tools. The AdmPwd GPO Extension is required if the machine you’re installing the management portion on will also be managed by LAPS.